Last Of The Dead Hot Lovers is the second in a planned trilogy of releases involving the Philippe Petit and Oxbow's Eugene S. Robinson. Robinson has been a recurring figure on releases from the prolific experimental composer Philippe Petit. The Crying Of Lot 69 was their first full collaboration. On this one they bring in Kasia Meow, vocalist for Poland's punk outfit Terrible Disease, as the verbal sparring partner to Robinson. The first of the two tracks, 'Dinner Done', documents a relationship in decay and decline. It, like all of Last Of The Dead Hot Lovers, is a harrowing listen, with the dramatic outpourings played by Robinson and Meow. The narrative unfolds in non-linear fashion with the voices occasionally multi-tracked and layered. Sometimes the voices are separate, other times the voices are heard together. Yet there's little interplay; they're neither conversational nor delivered in call and response type fashion. Last Of The Dead Hot Lovers shows two sides of a story but, at points, it's difficult to work out what's going on but there are clues scattered throughout the audio psycho drama that can be pieced together. Robinson's fills Last Of The Dead Hot Lovers with his pained bluesy drawl and unremitting howls of anguish. At points he is often reduced to gibbering or heaving sobs. Things aren't much lighter with Kasia Meow where at times her contribution is reduced to a series of distressed screams and cries. As they verbally duel, they reminisce about their doomed relationship where attraction ultimately turns to repulsion. "I like your anger. I think that's what I like about you the most" Meow confesses in 'Dinner Done'. 'Dinner Done' has obvious comparisons with 'Hurt Is Where The Home Is' from the Strings Of Consciousness album From Beyond Love where Robinson jostled verbally with Lydia Lunch amidst an avant rock score. 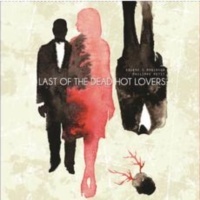 Last Of The Dead Hot Lovers is much more abstract and experimental than From Beyond Love. Kasia Meow proves to be a more than an adequate replacement for Lunch though. "Even his hands are stupid", Meow sneers. Robinson is painted as a "useless male". And by the end of the 'Dinner Done' those useless hands - it seems - belong to a dead lover. Like Lunch, Meow can veer from mocking tones to rage in an instant. "You can't even kill me properly" she scoffs goading Robinson. But it's apparent that she's not the victim. Amidst a series of disquieting tones and pummelling metal, Robinson sobs, as the sound cuts to near silence as life ebbs away. While the vocalists are the main focus, the soundtrack from Philippe Petit shouldn't be underestimated. With a score created from plucked sounds, screeches, industrial frequencies, hammered keys and the recurring metallic clash of the cymbalum Petit creates a turbulent atmosphere reflecting the state of the relationship. The almost apparent randomness of the score is deceiving, as Petit's score, spanning drone, industrial and musique concrete, is obviously devised to reflect and heighten the ongoing tension. While 'Dinner Done' may provide clues to the motive, 'Going. Going. Gone.' deals with the aftermath. "Do you believe in life after love" questions Meow repeatedly over Petit's grating droning soundtrack. Further on she coos "Don't cry baby" over static buzzing drones. With hesitant breaths and sobs Robinson ruminates on the events in his deep drawl amidst an atmospheric dark industrial drone laced with percussive clatter and chaotic shrieks while Meow's wails softly. In the absence of a linear narrative it's kinda difficult to be sure of what's just happened, especially when Robinson towards the end states: "We should have killed him...quicker, than we did". Is he speaking of another lover or himself or is it analogy to their own fated relationship. Who knows, but Petit closes it off with gentle organ drone and the metallic whirr of his favoured instrument, the cymbalum.